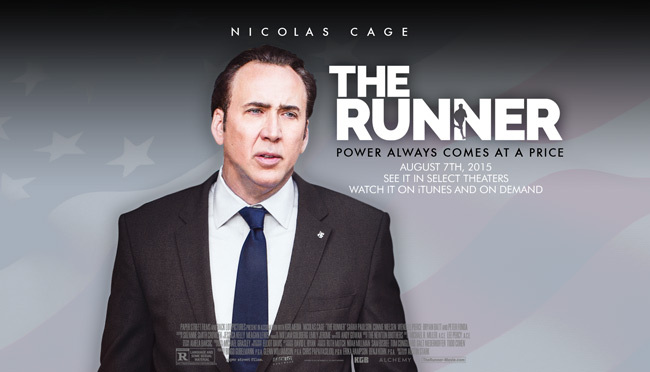 We worked with HighFliers to manage the UK theatrical and home entertainment release campaign for Political Drama The Runner, starring Nicholas Cage, Peter Fonda, Connie Nielson and Sarah Paulson. In the wake of the BP oil spill Colin Price rockets to political stardom. The trouble is, his personal life is a shambles and when his extra marital affair is exposed he is forced to resign, his wife leaves him and his career is in ruins. Six months later, while Colin is battling his demons, he is forced to confront his troubled past and decide whether to chase ambition or hold on to his last shred of dignity. We managed listings, digital assets and talent support, securing press coverage with media outlets including Daily Mail Event Magazine, The Guardian Guide, The List, Time Out London, What’s On London, The Culture Whisper, Female First, Virgin Media, The Fan Carpet, Movies in Focus, Garbage File, Battle Royale with Cheese, Film Juice, Indie Mac User, Live for Films, Screen Relish, The Edge Magazine, TMRW Magazine, Flavour Mag, Bright Shiny News, Vulture Hound, Front Row Reviews, and much more.